Price action before breakout. In some ascending broadening formations, prices make higher highs and form a solid, horizontal base at the start but then move sideways for many months. Eventually, prices rise above the formation top or slide through the bottom trend line and stage a breakout. Downward breakout. Once a breakout occurs, a pullback sometimes happens. Prices may continue moving up but they usually bounce off the lower trend line and continue back down. A pullback gives investors another opportunit to short the stock or add to their short position. Before shorting, however, make sure the pullback is complete and prices are declining once again. Measure rule. in the formation. For upward breakouts, add the height to the highest high in the pattern. For downward breakouts, subtract this value from the value of the horizontal trend line. The result is the target price. Wait for confirmation. If you own a forex pairs and it shows a broadening pattern, get worried. Many times the breakout will be downward, so be ready to sell. Only sell when the price closes below the horizontal trend line. Premature breakouts are rare, but they do occur. Do not be fooled; wait for a close below the lower trend line. your stop to just below the prior minor low. 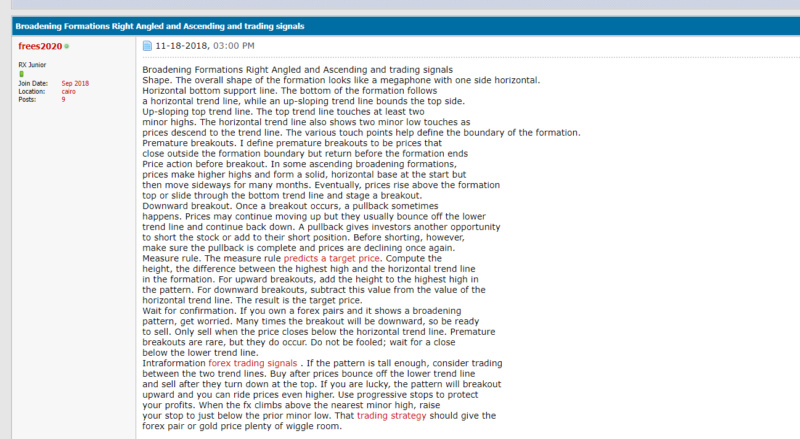 That trading strategy should give the forex pair or gold price plenty of wiggle room. What a f..k is that man?. You can't simple copy and past som text. Pay atention how is look like because this content have very bad look. One more thing. Ther is no need posting the same link 5 times because under your nick name you have the same link already. Where is some diagram. Put some chart so that we could see what's going on.